The 5-String Jameson Banjo with a closed back is a quality banjo that comes from a company that loves to provide customers with affordable musical instruments. This 5 string is a classic instrument that looks incredibly expensive. It’s made from some of the best, quality materials and has a sheen that will make you want to admire the banjo instead of playing it. This beauty of a banjo has the traditional 5 strings that are the essence of what people expect when they purchase or play a banjo. The closed back is made of rich, deep mahogany that makes this a showpiece as well as a playing instrument. You’d expect to pay hundreds of dollars for a banjo this stunning, but it’s actually very reasonably priced. It’s part of what makes Jameson/Davison Guitar such an amazing company for musical instruments. Even the beginning or starter instruments are built with care, precision, and pride. The company believes in making musical instruments accessible for anyone who wants to learn to play. Whether you have a passion for music or just a passing curiosity, Jameson wants you to be able to find an instrument that fits your needs. They have a range of affordable instruments from starter ones to those that professionals would love to play. New players don’t often understand that the banjo will arrive with loose connections. The bridge will have to be adjusted and the strings will need to be tuned. Some manufacturers will send their instruments fully deconstructed and will make the customer put the instrument together. The only assembly required for the banjo from Jameson is the bridge adjustment for the most part. If the company were to leave the strings tight and the bridge in place, you’d end up with broken strings during the shipping process. If you don’t know how to tune it yourself, don’t be afraid to spend a little money and have a professional tune it for you. There’s a maple bridge and a 7-ply maple neck on this 5-string banjo. The shell and resonator are made out of a beautiful mahogany wood with a delicious high-gloss look. The brackets and armrest are a chrome that really shines next to the glossed wood. If you wanted to hang this on the wall in plain view as a decoration, nobody would blame you at all. The resonator on the back is meant to thrust the sound of the banjo forward. It gives the instrument a bigger sound than if it were to be played without the back. In some instruments, the resonator can’t be taken off the banjo. 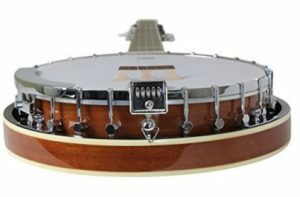 This banjo’s resonator has 4 thumbscrews on the back that allow it to be removed from the banjo to give it more variety than other 5-string banjos. You could easily remove the resonator and replace it to get the distinct sound you want with each song played. Inexpensive 5 string banjos will often have a friction tuner. This is what really shows the Jameson 5-String Banjo as superior to the competitors in the same price range. The inexpensive banjos from others will have a friction tuner, which relies on pressure to hold the tune. The geared 5th tuner has a peg that won’t slip and cause the 5th string to lose its tune. The 5th tuner is much like what you’d expect of a tuner on a more expensive banjo or guitar. The banjo comes with a chord chart, so you can get started with your banjo immediately. It’s the chords that you need to learn to play in G tuning for your banjo. It’s another way that Jameson cares about its customers. It wants you to successfully learn how to play the banjo, so you’ll have the best time learning. Is there a spot on this banjo to attach a strap? There are two spots where you can attach the straps that will allow you to wear this instrument while playing. Where do I find information about the manufacturer’s warranty? You can go to mdwsupport.com to register your new purchase and learn what kind of warranty you’ll get with the banjo. How wide are the nuts on the banjo? The Jameson 5-String Banjo has a 1.25” nut. Is this good enough to play for events? This is a lightweight banjo that has a stunning sound. The volume and tone are perfect for events with an audience. This Jameson 5-String Banjo is a reasonably price instrument with a beautiful sound to match its stunning look. You might even be tempted to keep this on the wall instead of playing it, but that would be a mistake. It’s even better when you’re ready to play it. It needs minimal setup out of the box and comes with a chord chart, so you can get started right away. Thank you for your time reviewing the Jameson Banjo. I kind of put the horse before the cart and bought it not really knowing a lot about banjos. Its everything you said and more. I’m loving it. Great Rhonda! Got any youtube videos?